Visited the Steven F. Udvar-Hazy Center near Washington Dulles International Airport which is the companion facility to the Smithsonian Air & Space Museum on the National Mall. It houses one of the largest collections of historic air and space craft in the world. The space shuttle Enterprise is the centerpiece of the James S. McDonnell Space Hangar at the National Air and Space Museum's Steven F. Udvar-Hazy Center in Chantilly, Virginia. HDR Image. Currently, the first space shuttle, Enterprise, takes center stage in the Manned Spaceflight exhibit. I say currently as it will soon be replaced later this month by Discovery. Enterprise was never launched into space as it was the glide and test vehicle. I processed this HDR image to look more like an artist rendering might look like. 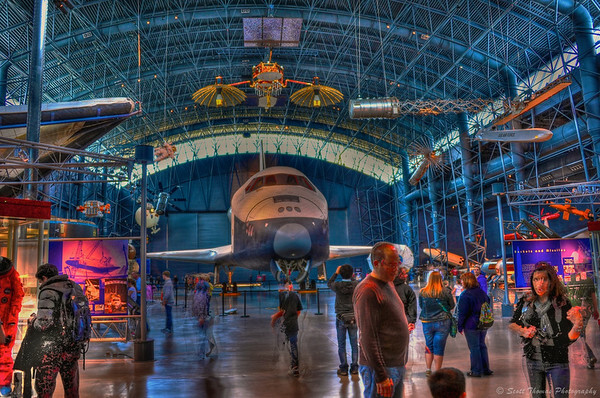 This entry was posted in Travel, Weekly View and tagged "washington, 28-300mm, air and space, dc", enterprise, hanger, hdr, high dynamic range, james s. mcdonnell, museum, nikon D700, photomatix, space shuttle, steven f. udvar-hazy center, vr. Bookmark the permalink. Yes! Wish I could see this super duper large. Love the edit. Bravo. It will be coming to Google+ sometimes this week, Joe. That is one of the most stunningly curated spaces in the amazing national collection of museums. Nice treatment of the image. Sad to say…. I lived in the DC area for two years and never made it to the Smithsonian! !